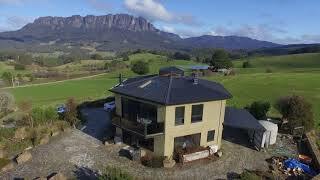 Eagles Nest Retreat offers three award winning self-contained luxury, spa, retreats nestled in the idyllic countryside near Sheffield, and Cradle Mountain in north western Tasmania. The Retreat is surrounded by a working dairy farm and offers a luxurious and secluded location. Whether it be a short break with friends or a romantic honeymoon, Eagles Nest Retreat offers a luxury hideaway, that is exclusively yours to enjoy. Spend time exploring nearby Cradle Mountain, before returning to a your retreat to enjoy one of the many spas, or indulge in our in-house services. There are three accommodation options to choose from. Nest I is a unique two storey hexagonal design which can accommodate up to four people. 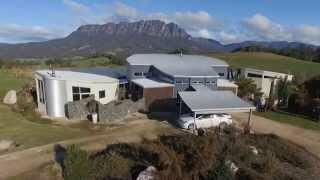 Nest II is the grandest building of the three and winning a Tasmania Master Builders award it also has incredible five meter high windows to enjoy the majestic views of Mount Roland. Nest II has three bedrooms and can cater for up to eight guests upon request. Nest III which is inspired by a South American Farmhouse ‘Finca’ has two bedrooms and can accommodate up to six people and like the other properties has it’s signature design features. For individual prices please check out our website. We have 3 properties Nest I, Nest II and Nest III which can accommodate 4, 6, and 8 individuals respectively.